Yee-haw! It's my turn to share my hobby with you today--Photography! 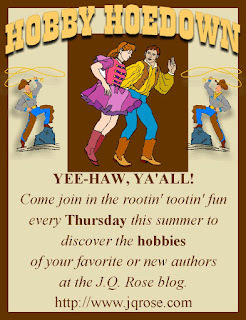 When I planned this Hobby Hoedown event I thought we would be on vacation so I didn't want to invite a guest, then desert them. No vacation this week, but still happy to share this hobby with you. I enjoy taking pictures of my family, friends, flowers, and nature. Well, you'll see what I mean. I have taken a couple of photography classes, but I take photos for fun so I'm not too serious. I can spend hours playing with them in a program to crop, brighten, use special effects, etc. I use Picasa. It's free to download and a Google product so I can easily share photos on my gmail account and make web albums (but I don't.) There are so many possibilities with Picasa. I took a class on Adobe Photoshop, but the version we learned is not the version I have downloaded on my laptop, so I haven't taken the time to figure it out.. If I did, I'd spend even MORE time playing with the photos. I add my photos to my blogs and website. That way there's no worry about copyright usage since I own the photos. And I can use my photos for greeting cards, signs, and even recipe books which I make using The Print Shop 22. The Alaska Journal on this blog is filled with photos from our trip last summer. You can imagine how many photos I collected on this trip. It was hard to narrow down four or five for the blog post for the five part journal. Click Alaska Journal to see the posts and pictures. Flowering trees burst with blooms this spring. Yes, roses. Gotta have roses on the J.Q. ROSE blog! Giant purple globes are Aliums in our front planter. Members of the onion family. Peonies--that's why we bought this house. Loads of bushes here! Please check back on Thursday, July 11, for the next Hobby Hoedown with Viola Ryan's landscapes! What absolutely gorgeous photos. I enjoyed your post very much! Great post, JQ. DH and I love to take pics on our trips. Many are hanging on the walls in our home. Tell me more about the peonies. I remember my grandmother growing a side yard full of them. They had bees and seemed to tower over me. Of course, I was about 5 or 6 maybe. Your bush looks short. Is the height thing just a product of memories or do some varieties grown tall? Super post. I'll have to use your idea at my blog.